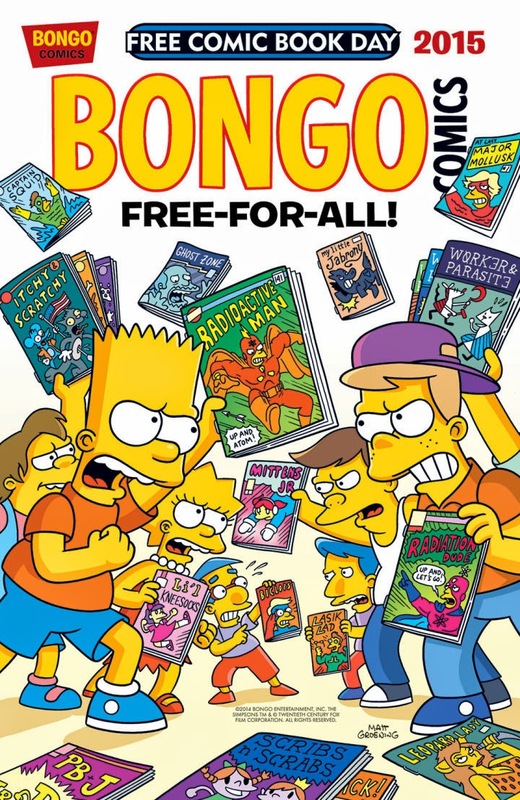 The Free Comic Book Day (FCBD) Committee has selected the twelve Gold Sponsor comic book titles for the comic book industry’s most anticipated annual event, Free Comic Book Day. 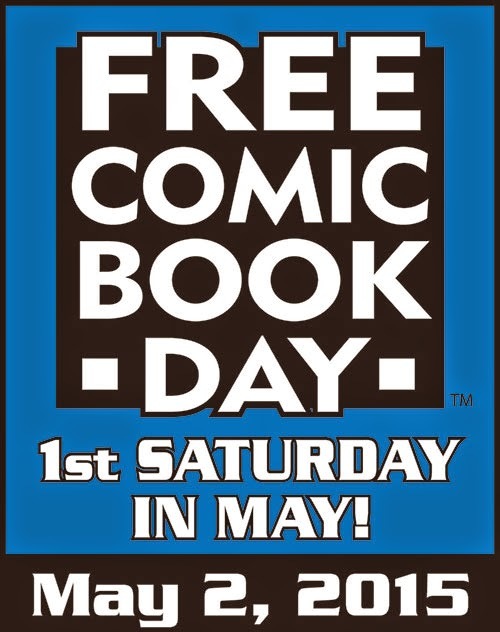 FCBD takes place every year on the first Saturday in May at participating comic book shops worldwide with next year’s event taking place on May 2nd, 2015. 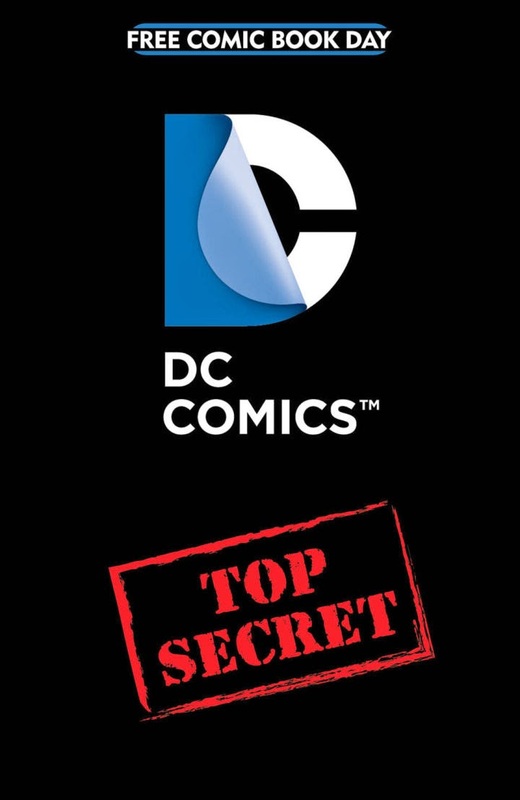 The FCBD Silver Sponsor comic books announce next Wednesday, December 17th. A complete listing of all fifty FCBD titles, including the twelve Gold Sponsor comic books and thirty-eight Silver Sponsor comic books, can be found in the January issue of Diamond Comic Distributors’ PREVIEWS catalog, on sale at all comic book shops December 24th, 2014. For more FCBD news and updates visit www.freecomicbookday.com and become a fan on Facebook at www.facebook.com/freecomicbook and follow on Twitter at www.Twitter.com/freecomicbook. THE BLACK HOOD! THE FOX! THE SHIELD! Get in on the ground floor of Dark Circle Comics and experience the cinematic and creator-driven reinventions of these iconic properties. Who is the new Shield? How did the Black Hood come to be? Can things get more unpredictable for The Fox? 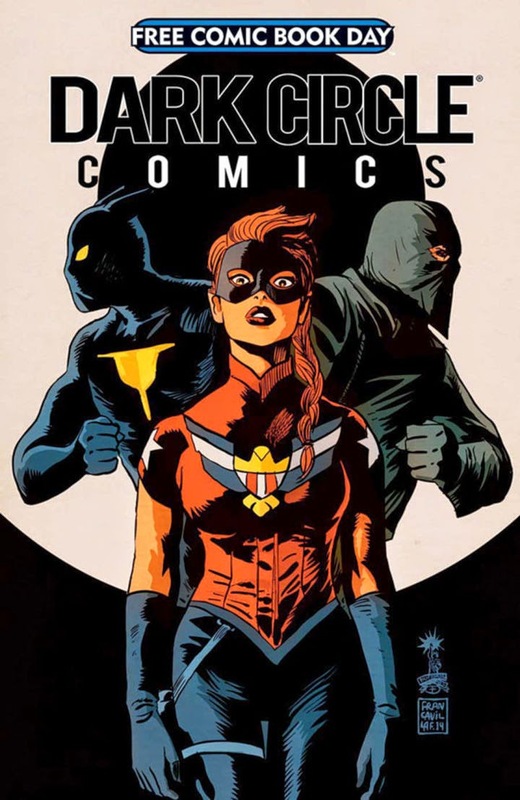 Learn the secrets of the Dark Circle universe from the creators themselves via sneak peeks at the new series, creator interviews and a first glance at the next Dark Circle series — all held together by an eye-popping cover from Afterlife with Archie artist, Francesco Francavilla! 32pgs, FC FREE! Get in line for the foremost Free Comic Book Day four-color giveaway of the year! When Bart brings one of Professor Frink’s recent discoveries to school, it leads to some hair-raising hilarity! Then, Lisa finds a doorway to an ancient past, Comic Book Guy gets a hip new girlfriend, and Homer tries his hand at some home improvement... and much more! 32pgs, FC FREE! 2015 is BOOM! 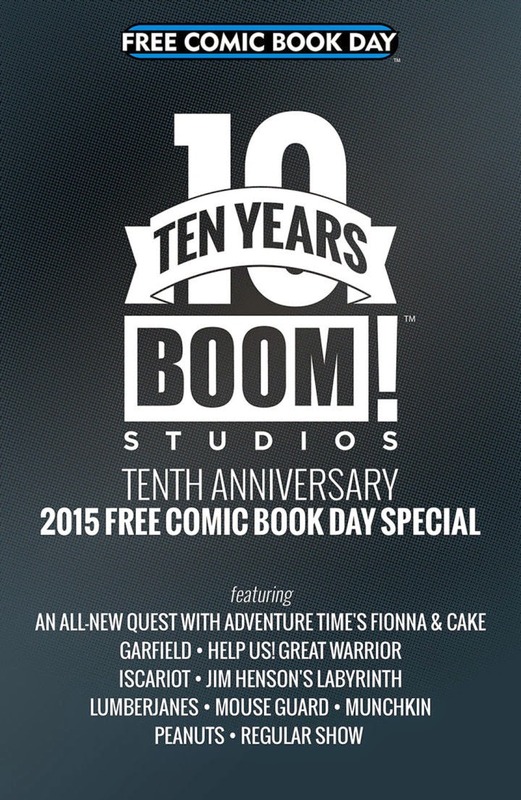 Studios’ Tenth Anniversary year, and to help us celebrate we’ve gathered short stories from several current and new all-ages titles for Free Comic Book Day. From Archaia’s Mouse Guard, Jim Henson’s Labyrinth, and new title Iscariot; KaBOOM!’s Garfield, Peanuts, Regular Show, and a new Adventure Time with Fionna & Cake story; and BOOM! Box’s Lumberjanes, Munchkin, and Help Us! Great Warrior, there’s something in this free, 48-page issue for everyone! 32pgs, FC FREE! Dark Horse Comic’s most thrilling FCBD to date! 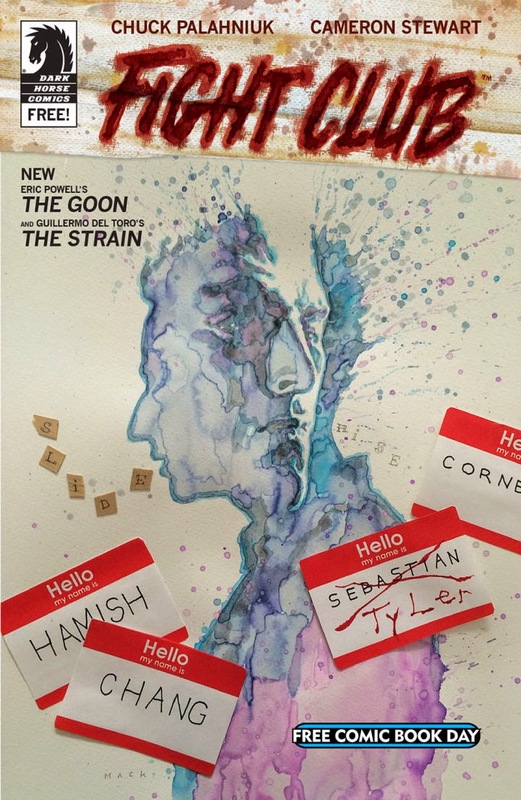 Chuck Palahniuk and Cameron Stewart premiere Fight Club! Eric Powell serves up an all-new tragedy in The Goon! And Guillermo del Toro presents an all-new chapter from The Strain! Need we say more? 32pgs, FC FREE! Bob's Burgers, the hit TV show created by Loren Bouchard, is now a comic book! 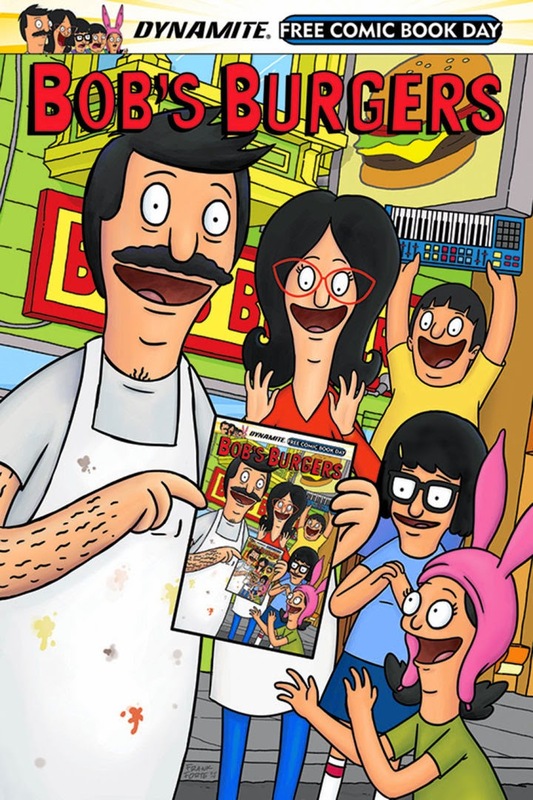 The Belcher family — parents Bob and Linda, and their children Tina, Gene, and Louise — appear in this special Free Comic Book Day edition that collects the "Best Of" in-canon stories from Dynamite's first-ever Bob's Burgers comic book series. Thrill to Tina's “Friend Fiction”, Louise's “Unsolved Mysteries and Curious Curiosities”, “Gene Belcher Presents: The Musical”, and more! It's an all-ages extravaganza that captures the feel of Bob's Burgers perfectly — because it's a comic 100% created by show writers and animators! 32pgs, FC FREE! Optimus Prime is gone — and Decepticons are on the loose! It’s up to Bumblebee and an elite crew of Autobots to track them down before their rampage spreads across Earth! Transformers comics have never been hotter, and the excitement spreads to this all-original comic inspired by the all-new animated series! 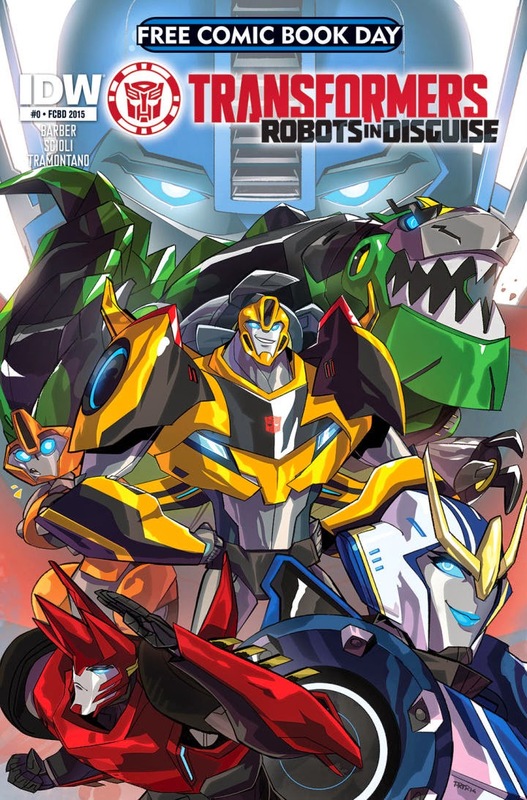 Plus: previews of IDW and Hasbro unbelievable publishing slate for 2015, including an exclusive Transformers vs. G.I. Joe strip! 32pgs, FC FREE! 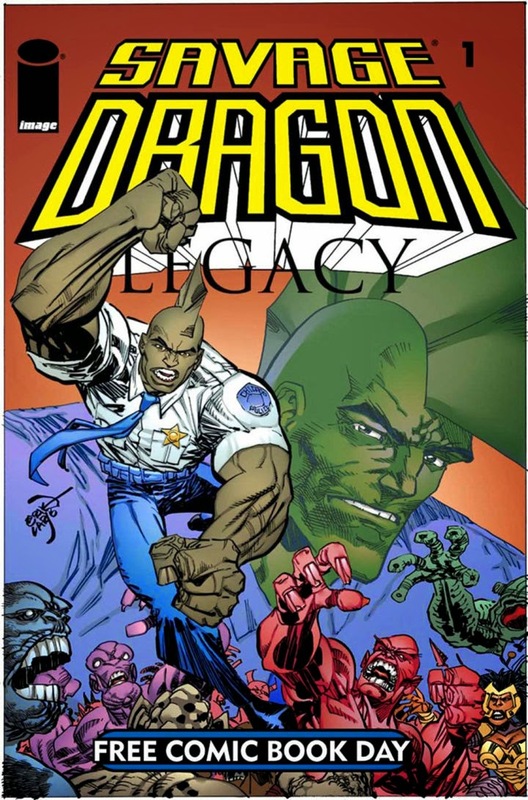 The generational saga of Savage Dragon reaches a new milestone as Malcom Dragon graduates high school and follows his father’s footsteps to the Chicago Police Department. Every young new officer has a lot to live up to, but for the son of a world famous figure as renowned as he is reviled, navigating the world of law enforcement is especially challenging. The cost of failure is high in a city becoming more dangerous by the day: Can Malcom step out of his father’s shadow and become the hero Chicago needs, or is he doomed to make the same mistakes? 32pgs, FC FREE! Prepare yourself for the final days of the Marvel Universe as you know it as the march to the biggest comic event of the year continues! From the ashes of a decimated cosmos rises… Battleworld! Amid the strange, patchwork realm, refugees from thousands of obliterated universes struggle for survival. Even if they can endure the horrors of Battleworld — the home they knew has been destroyed! 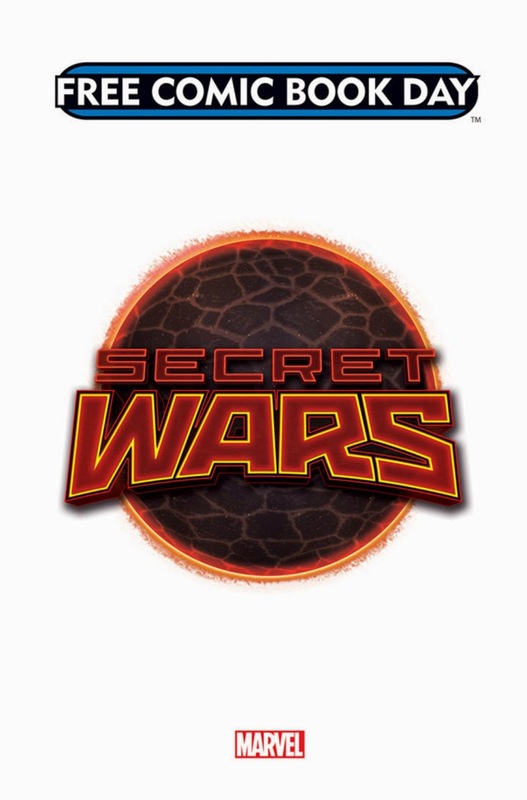 Time has run out, and the opening salvo of Secret Wars has been fired. But can anything restore the Marvel Universe that once was? 32pgs, FC FREE! 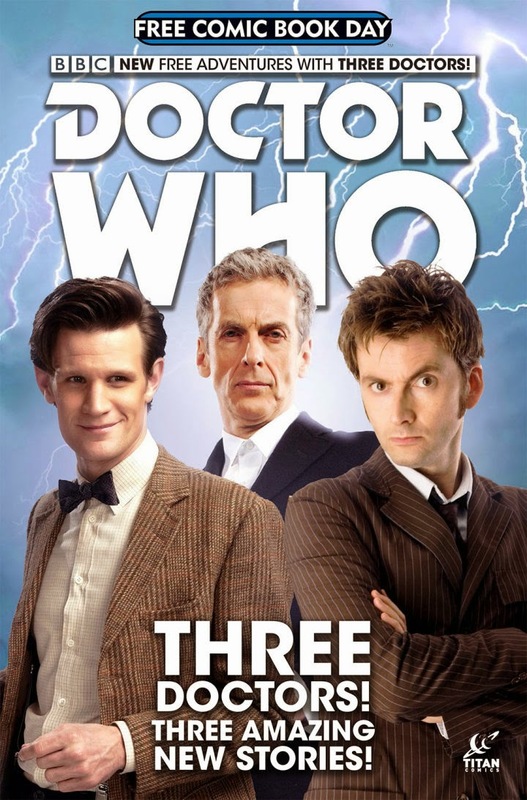 Take a blistering trip through time and space with three stunning all-new short stories featuring the Tenth Doctor, the Eleventh Doctor and the brand-new Twelfth Doctor, written and drawn by the ongoing Doctor Who comics creative teams. PLUS: A sneak peek of the Top Secret Summer 2015 event! Be the first to get a hint of the epic that will shake the Doctor to his very core! It's a must-read for fans, and the perfect primer for anyone looking to jump on board the TARDIS! 32pgs, FC FREE! 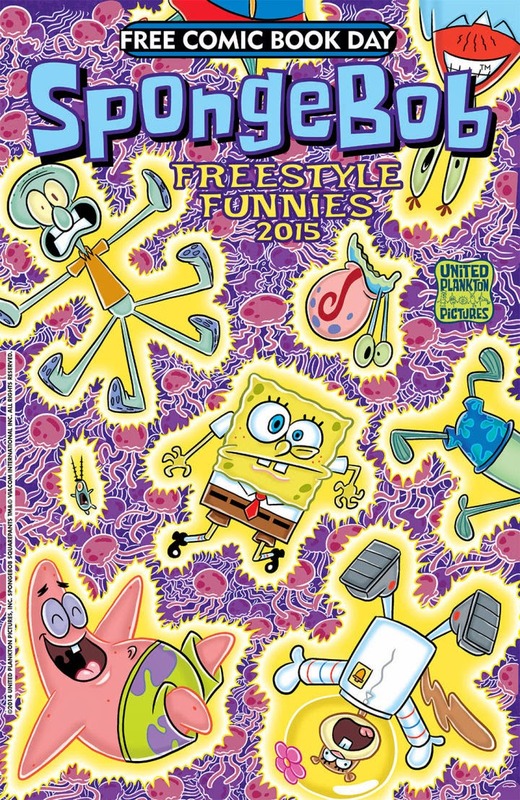 This year's SpongeBob Comics FCBD offering features a 22-page story by Boxtrolls director and Grickle cartoonist, Graham Annable! In "Tangy!" Plankton's new special sauce made from jellyfish jelly has strange effects on SpongeBob and the rest of Bikini Bottom's residents. The only one unaffected, the only one who can save them all, is a very reluctant Squidward! Plus, more undersea sequential stories by James Kochalka, Maris Wicks, Gregg Schigiel. and other awesome aquatic artists! 32pgs, FC FREE! 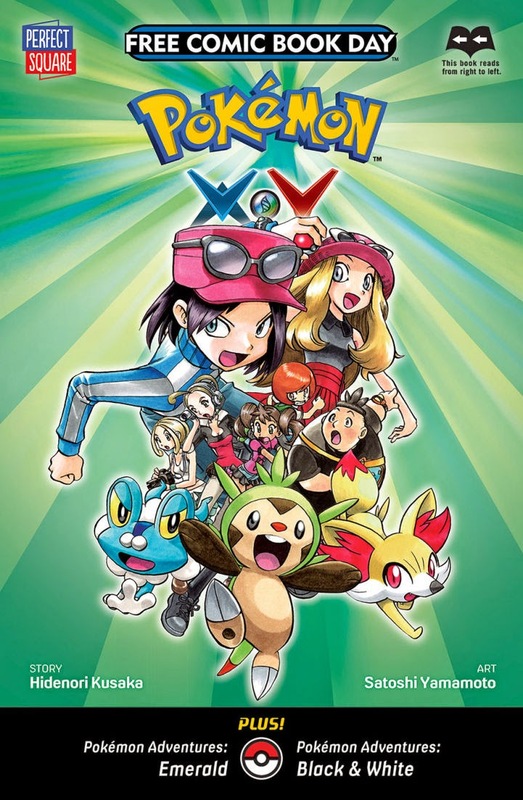 All your favorite Pokémon game characters jump out of the screen and onto the pages of this action-packed Free Comic Book Day edition comic! Legendary Pokémon Xerneas and Yveltal ‘s battle against each other is destroying Vaniville Town. Can X and Y save the town in Pokémon X*Y?! Bonus Feature: More action in Pokémon Adventures and Pokémon Adventures Black and White! 32pgs, FC FREE!